EL glow wire or electroluminescent wire is a great new light source that requires little power but provides a fantastic glow. 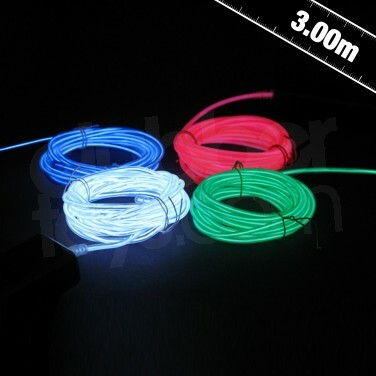 With these fantastic ready made EL glow wire packs you can light up anything,: you could have a glow wire tent, a glow wire camper van, a super EL wire bicycle. The possibilities are endless! Apply glow wire to clothes, doors, caravans, tables, shelves etc. to make them REALLY stand out with a fantastic glow. These EL glow wire kits are ready to use & need no assembly or extra parts (just batteries) - just simply apply the glow wire where you want it. They come retail packed & have flashing or constant options. El Wire 3m - Green EL Glow Wire power packs that can be used in all manner of ways. All you need to get glowing! EL Wire or Glow Wire is very adaptable - let the ideas flow! El Wire 3m - Blue EL Glow Wire power packs that can be used in all manner of ways. All you need to get glowing! 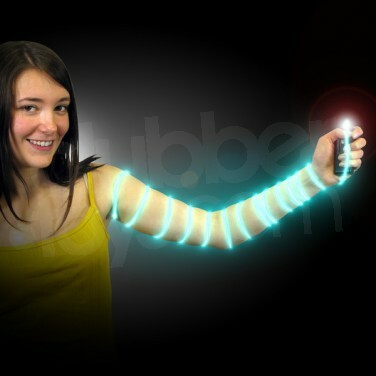 EL Wire or Glow Wire is very adaptable - let the ideas flow! El Wire 3m - Pink EL Glow Wire power packs that can be used in all manner of ways. All you need to get glowing! EL Wire or Glow Wire is very adaptable - let the ideas flow! El Wire 3m - White EL Glow Wire power packs that can be used in all manner of ways. All you need to get glowing! EL Wire or Glow Wire is very adaptable - let the ideas flow! Add a funky glowing trim to your clubbing outfit and stand out from the crowd using fabulous and versatile EL Glow Wire in 5m lengths!